If you’re growing bored of spinning the reels of a single slot, why not try spinning multiple slots at once? We aren’t talking about opening multiple Web browser tabs each with a different slot in it, but rather the unique MegaSpin format of pokies only available online. While we often think of progressive jackpot pokies when we hear the prefix mega (check out the Mega Moolah and Mega Fortune progressives to see what we mean), but in this case it means more spins thanks to the inclusion of more slots in the one game. MegaSpin slots see multiple machines in the one screen, which all operate independently of each other to give you more chances to win. Depending on the title, there is either a set amount of extra slots, anywhere from four to nine included in the one game that can be played all at once – there is also the option to pick how many extra slots you want to play at once. The slots included are still standard video or classic slots featuring symbols, reels, and bonus features and you can play either 5 reel or 3 reel MegaSpin pokies. It is important to note that you can’t play both 5 reel and 3 reel slots in the one game. Each slot within the MegaSpin title operates independently of each other, so you can either win on just one machine, win on all machines, win on some but lose on others, or worst case scenario lose on all of the the machines in play. Depending on the title, you will then be paid out in accordance to the payout table – be sure to check this before you start spinning. The masters behind MegaSpin pokies is top leading software developer, Microgaming, meaning the graphics are stunning and the gameplay is smooth. We have found the four most popular MegaSpin slots available at the following online accredited casinos. MegaSpin Double Magic is based on one of the first online slots called Double Magic. It follows the same format but includes extra games in the one title. MegaSpin Double Magic features up to nine eligible 3 reel slots in the one game. You can opt to play four, six, or all nine of the slots at once. Each have just one payline with a maximum 18 coins per spin with all games in play. You can also win up to 14,000 coins if you manage to win on all nine of the games. Unfortunately, MegaSpin Double Magic is only available on the downloadable version of Royal Vegas; Mac OSX users miss out on this one. 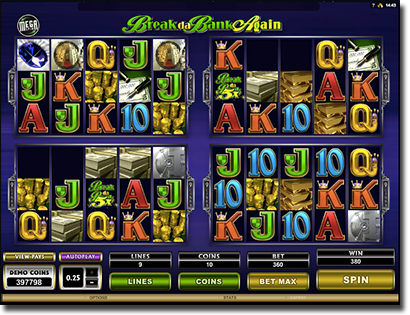 MegaSpin Break da Bank Again is based on the Break da Bank Again slot and therefore again follows the same format but includes more titles. There are four slots in play, which cannot be altered, and each slot in this title features nine paylines across 5 reels with each offering a maximum of 90 coins per spin (360 coins per spin all up). There are up to 25 free spins available to be won per slot with a 5x multiplier. This means there are up to 100 free spins to be won in one go, with a 5x multiplier applied. MegaSpin Break da Bank Again is available on the instant play platform, meaning both Mac and PC users can try this one out. Based on the classic slot High 5, High 5 Mega Spin is quite similar to MegaSpin Double Magic slot in that it features up to nine slots with 3 reels and one payline. You can opt to play all nine, or just four or six instead, similarly to Mega Spin Double Magic. You are able to bet 27 coins maximum per slot if all nine slots are in play. Additionally, you can win up to 15,000 coins if all slots are being spun. Unfortunately High 5 MegaSpin is only available in the downloadable format so you will have to download the Roxy Palace casino, only eligible for PC users.